Colette has studied history, management, marketing, writing, music, and dance, and has worked in management, publishing, and communications. She attended Red Herring murder mysteries on a regular basis with her husband until she unintentionally attended a show in period costume and was mistaken for a visiting actress. She has been performing with Red Herring ever since. “The villain is the best part." Mike is married with four children. He majored in English at Michigan State University, where he also attended a few acting classes. His other major acting experience was playing “the Stage Manager” in high school. Mike has designed and developed computer information systems and leads historical and sightseeing tours. Ken Oyer has been a Red Herring member since 2008, the same year he retired from the Army. Prior to having an active role with Red Herring Productions, Ken lent his hand for a short time as an actor for a local haunted house and has emceed multiple stages at the What If… Festival produced by Imagination Celebration. 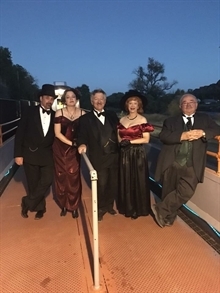 In September 2014, Ken was asked to step out of his comfort zone as a jokester in order to portray Colonel John Chivington of Sand Creek Massacre infamy to pleased audiences. Star studied music and theater. She has performed in Colorado, Wyoming, North Dakota, Kansas, and Utah in theater, television, and films. Star taught children's theater. She is married with one son. Along with the acting, props, and costuming, she likes to bake goodies for the casts. A Colorado native, Don is a father and husband, a decorated veteran of Viet Nam, a Senior Electric Engineer, and a well-seasoned actor. 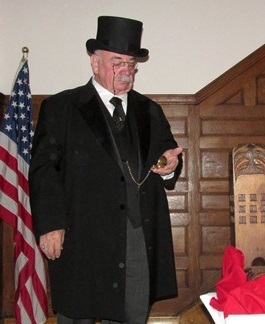 He has a bachelors degree in history and uses that degree to entertain as President Theodore Roosevelt. In his position with Red Herring he has entertained more than 7,000 people each year and has coordinated events in five states providing entertainment for a broad variety of convention, corporate meetings, fundraisers, and private shows.